The production two-seater variant of the Messerschmitt's jet fighter, called Me 262B-1, was devised solely for conversion training purposes. For a fighter pilot accustomed with the piston-engined aircraft the Me 262 was a vehicle of a different age. The tricycle undercarriage, twin engines, completely new type of propulsion notwithstanding the temperamental throttle control - all contributed to the need of conversion trainer with instructor in the rear cockpit. As was the accustomed practice, two-seater machines were not to be built new but converted from fighter models. About 120 machines of this variant were finished during 1944 and 1945. Initially, the idea of a night-fighter 262 was developed independently by Messerschmitt as the Me 262B-2. It was to have a longer fuselage accommodating the two crew, internal fuel tanks with the capacity comparable to that of a single-seat variant, and a Berlin radar antenna hidden inside the modified nose cone. However, by the end of 1944 the war situation deteriorated so rapidly that it was realized that an interim solution must be found before the B-2 could reach production status. Thus some of the existing trainer machines were converted once again to interim model nightfighters becoming Me 262B-1a/U1. The conversion comprised a FuG218 radar with operator occupying the rear cockpit. Before the collapse of German defences, only a handful of this type reached operational use with a single unit, 10./NJG11 at Magdeburg. Single prototype with FuG 220 Lichtenstein SN-290 MHz radar transceiver and Hirschgeweih antenna array, for trials as a night-fighter. The Germans had several radar systems, produced by highly specialized manufacturers, such as GEMA, Telefunken, Lorenz and Siemens. Radar Lichtenstein BC, developed by Telefunken in 1941, operated on a frequency of 490 MHz with a 620 mm wavelength. It required four double pairs of dipole antennae bristling from the aircraft’s nose. It had a search arc of 24 degrees and a range of between 3,000 and 5,500 m depending on conditions. Provided with three scopes for azimuth, ranging and elevation, the radar was, however, far from user-friendly, and even experienced operators often had to rely upon ground control to vector them into the right area. Radar 220 Lichtenstein SN2 was an improved and more accurate model developed in 1943, operating on long waves of about 90 MHz. Working through the distinctive “stag’s antlers” aerial, the SN2 was only slightly affected by the RAF’s “window” countermeasure. Radar Flensburg, developed by Siemens, was introduced in mid–1944 using wing-mounted dipole antennae, and was sensitive to frequencies 170–220 MHz. Radar 218 Neptun was introduced in 1944 by Siemens; it used frequencies 158 to 187 MHz and had a range of 120 to 500 km. Radar 240 Berlin, introduced in April 1945, used a 9 cm wavelength. These devices were mounted on a few special night-fighter designs. The Messerschmitt Bf 110 remained the primary Luftwaffe night fighter until 1944; the aircraft (G version) proved able to take the addition of radar, a third crewman to operate it, and heavy armament. 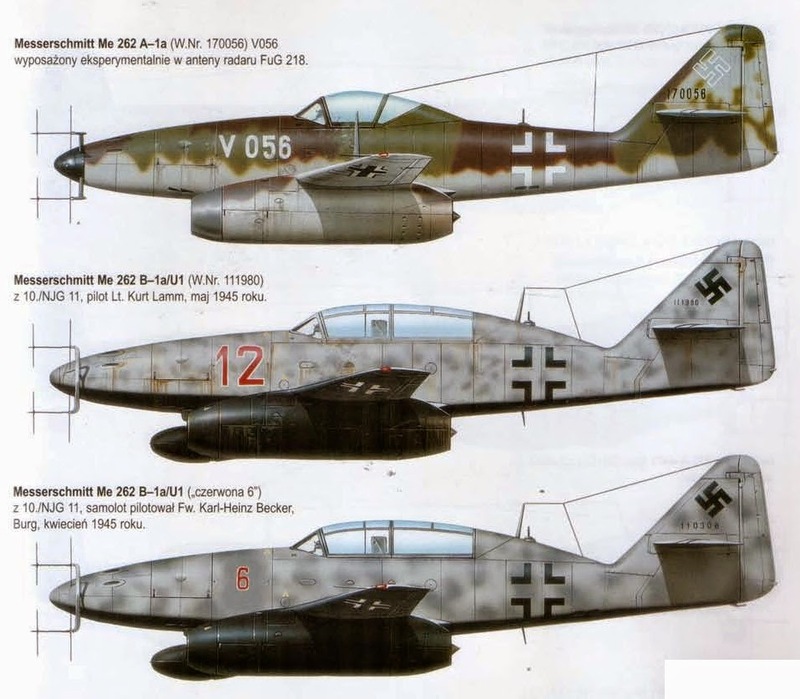 Other night fighters included the Heinkel He 219, and modifications of existing designs of Me 220, Me 262 and Me 410 variants, Dornier Do 217 E and N, Junkers Ju 88 G-7 and Ju 188. Reconnaissance version modified in small numbers, with Reihenbilder RB 20/30 cameras mounted in the nose (sometimes one RB 20/20 and one RB 75/30). Some retained one 30 mm (1.18 in) cannon, but most were unarmed. 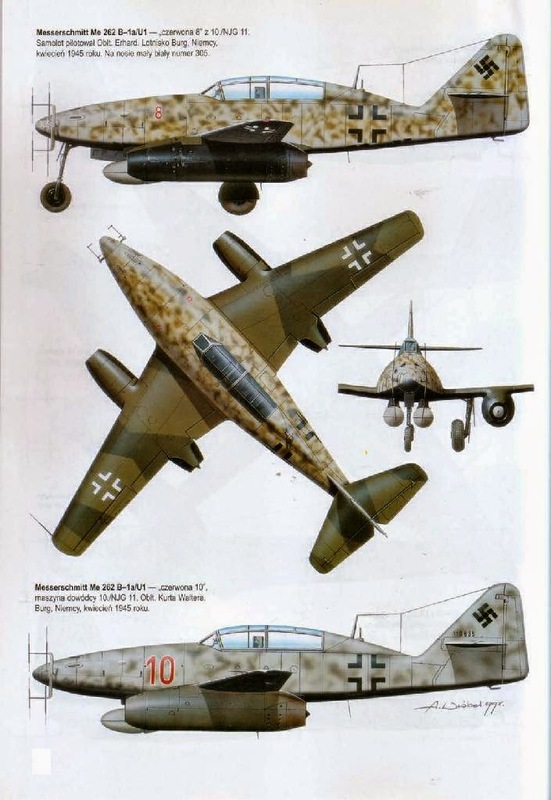 Me 262 B-1a trainers converted into provisional night fighters, FuG 218 Neptun radar, with Hirschgeweih antenna array. Proposed night fighter version with stretched fuselage.